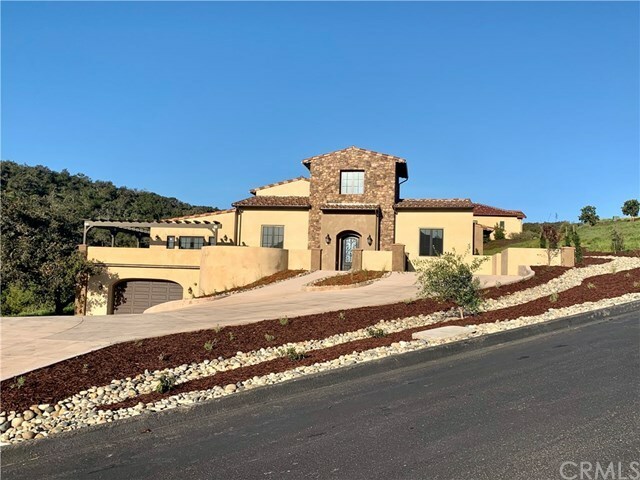 NEW HOME, Tuscany style architecture in the exclusive Monte Sereno Estates. Incredible Views with 3 bedrooms, 31/2 baths, optional 4th BR, or office. Over sized garage (30â x100â) with capacity to hold 10 cars and room for a workshop. Solar roof panels above kitchen. Great room and dining with 23â high ceilings, open concept great for entertainment. Kitchen with oversized granite island, top of the line Thermador appliances. Outdoor access throughout, covered outdoor living space with fireplace/heater. complete wraparound viewing deck. This very special home will delight the discriminating buyer with a need for a 10 car garage, a must see. Directions: from the AG village go east 5.5 miles to the first vinyard make a left on Mission Springs Gate code Req.